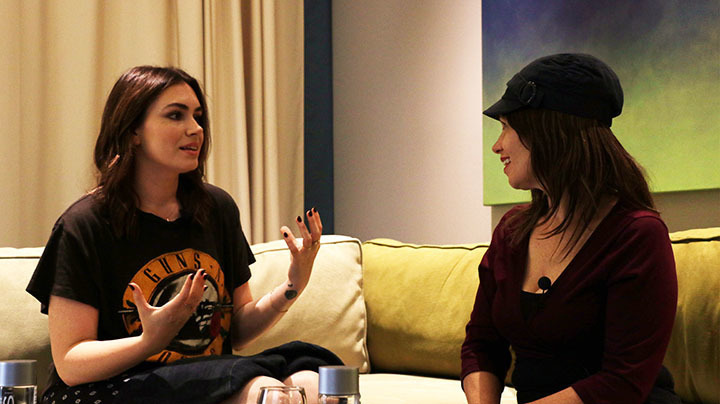 In an intimate conversation at the Sunset Marquis, I dish with singer, songwriter, acress and on-line host, Sophie Tweed-Simmons. Level headed and wise beyond her years, Sophie and I discuss her songwriting process and her stance on social media. She shares some words of wisdom for those navigating their on-line lives and has some thoughtful comments for young women and men who, due to the pervasive nature of social media, have more body comparison pressures than ever before. Indeed, her work with the on-line sites Refinery 29 and Adoreme.com around positive body image have been impactful for many of her followers. In addition, Sophie shares what she thinks about this crazy election and brings some smarts to the madness that we have come to know as the 2016 election process. Of course, we also touch on growing up with her rocker Dad, Gene Simmons. Listen in and enjoy the most recent episode of The Celebrity Dinner Party with Elysabeth Alfano!